Bring three note cards, each one with a n idea you have always wanted to investigate or try in your classroom. Leave your cell phone, doubts, I can'ts, and it won't works at home. See you at 8 a.m. on August 31 in the school cafeteria. Breakfast and lunch will be provided. This was definitely not business as usual! Consider rafting a river with a group of friends. There is a guide, there are charts and maps of the river, and there is a sense of adventure as the group descends into the water. There are challenges ahead—perhaps boulders under the water that could sink the raft. Whitewater rapids and currents of varying strength are downstream. The guide instructs the group to listen to his commands, asks that each person be alert to potential hazards, and trains the group to work together. Throughout the journey, the group's trust in their leader grows, as does their sense of exhilaration in doing something successful together. Shared leadership in schools is a similar journey. Through collaboration, collegiality, community, cooperation, and communication, interdependence emerges and is nourished. Interdependence is quality of connection built on trust and respect. For schools, the vehicle for building interdependence is not a raft but groups of teachers organized into teams—grade-level groups, departments, and small professional learning communities, each headed by a leader who facilitates the group's work and guides it toward a common end. As a faculty develops a shared, organization-wide understanding of who they are and what they are about, they are increasingly able to engage in ongoing, meaningful conversation that, if wisely and carefully conducted, becomes action on behalf of students and marks progress toward identified goals. Historically, schools have operated on a hierarchical model. There is a leader at the top, who is charged with overseeing groups of teachers, who are charged with overseeing groups of students. Although teachers and others on staff work side by side, eat together, laugh, and share stories together, for most of the day they work alone, in their own individual classrooms with the doors closed. The faculty might meet monthly to hear updates about upcoming events, budget issues, schoolwide behavioral concerns, and district messages. Faculty meetings seldom involve robust discussions on issues or tackle curricular or instructional undertakings. When decisions are made, everyone knows it's the principal who says what's what. It's the principal who manages the operation. Over the past several decades, a new model of interdependence has emerged. Margaret Wheatley (2000) describes this approach as one in which "people organize together to accomplish more, not less" (p. 340). She goes on to note, "Behind every organizing impulse is the realization that by joining with others we can accomplish something important we could not accomplish alone." Schools, as living systems, have a great capacity to organize and to bring energy and passion to the work they undertake. When the system works as an integrated whole, with everyone in the organization connected around a central purpose, a synergy happens that can propel a school forward. We see this happen, for example, when faculty members commit to fully implementing new, cross-grade instructional strategies for reading, and then reading scores go up. We see it when a school faculty faithfully conducts data reviews and provides an array of instructional supports designed to help students meet grade-level reading and math standards, and then increasing numbers of students meet these standards and go on to graduate. Leadership in learning institutions means everyone understands and embraces the school's vision for student success, and everyone on staff participates in the journey toward that end. As Charlotte Roberts writes in The Fifth Discipline Fieldbook, "An interdependent vision can be realized only through collaborative action, so relationships at work become central" (Senge, Kleiner, Roberts, Ross, & Smith, 1994, p. 231). To re-energize, redefine, or re-establish the school's direction so that it provides opportunities for all students to succeed, there must be a collective responsibility for strengthening relationships and for improving academic achievement. This is the challenge administrators and teacher leaders share. Fortunately, there are strong models for us to follow. Numerous major longitudinal research studies of effective schools attribute gains in student achievement to the work of small learning communities, team structures, and collaborative decision making (Jackson, Davis, Aheel, & Bordonaro, 2000; Lipsitz & Felner, 1997; Marzano, 2003; National Association of Secondary School Principals, 2000; National Middle School Association, 2003, 2005). Similarly, in The Fifth Discipline (1990) Peter Senge references teams, decision making, and a task orientation as crucial for any learning organization. Robert J. Marzano (2003) provides additional insight when he identifies three components that are necessary for establishing an interdependent work environment: broadening the range of participants in conversation, sharing power, and enhancing interpersonal relationships. Correspondingly, literature on high school reform points to "twin pillars … (1) instructional improvement and (2) structural changes that personalize learning" (Quint, 2008, p. 68). However, structural changes do not automatically result in substantive conversations or strengthened relationships among the adults who populate the school. Fostering a culture of interdependence relies on more than the structural apparatus usually in place in schools, which includes the building's schedules, how space is used, which rooms are allocated to which programs, and how adults spend their time. For example, team teaching can be an effective structure, but teaching side by side should not presume the two teachers will have conversations about students' challenges with curricular concepts or about the instructional strategies in use. The building's schedule might allow a group of teachers to share a common planning time but that, too, does not guarantee the teachers will meet together to assess student work or solve problems related to curriculum alignment. The truth is, the critical work of schools is done through relationships among people. These relationships must be nurtured and attended to so that conversations move beyond collegiality to collaboration and a commitment to improving one's practice. In fact, recent research reviews done by the National Staff Development Council (2008) identified working in teams as the model for strengthening teaching practices. Also important, according to Jacqueline Ancess, coordinator of the National Center for Restructuring Education, Schools and Teaching, is that teacher relationships be "caring [and] characterized by interdependency, trust, respect and a sense of collective responsibility for students and school outcomes" (2008, p. 50). As William D. Greenfield (2005) writes, "The challenge for a school leader is to spark and sustain such a dialogue and to work with and through teachers to develop a shared commitment to implementing the desired practices effectively" (p. 249). Moving toward this vision of strong relationships and a focus on student success begins by renewing an understanding of the purpose of the collective work in a school. Like the river rafters setting out on their journey, a faculty needs to know where they are all going and what each individual must do to help the school reach that destination. To successfully navigate a river, ongoing conversation is a must. In school environments, those who lead must be willing to reexamine existing structures and processes and consider how else the school might organize itself to achieve the desired ends. New structures to consider are those that strengthen collegial relationship and provide a forum for many parties to share their voices and contribute to the conversation about how to support learning. These structures go by many names: professional learning communities (PLCs), Critical Friends Groups, interdisciplinary teams, and departments. What is your vision for your school? What current leadership model exists in your school? How are decisions made in your school? Interdependence does look different depending on the school, the environment, and other variables. Let's consider a couple of examples. At Fir Grove Elementary School in Beaverton, Oregon, a Title I school of about 500 students, all teachers are members of a grade-level team. In 2007, the principal assessed relationships in the grade-level teams, agreed with the teams' purpose, and challenged staff to focus more specifically on using their team time to become a professional learning community. Now, each week, one of the grade-level teams meets for the entire day as a PLC to discuss best practices, share effective lessons, and talk about ways to meet student needs. Making time for this embedded staff development has energized the Fir Grove faculty. They have been able to make their vision of ongoing teacher-led professional development a reality by leveraging a very traditional structure (grade-level teams) that was already in place. Then there is Lake Oswego Junior High School, where teachers are organized into four core academic teams for instruction and also divided into curriculum departments. Both groups—teams and departments—meet regularly, often during weekly early-release time, to engage in professional growth activities and build relationships between and among colleagues. These complementary structures provide two avenues for adults to get to know one another better, to work together, to support each other, and to share student-related concerns and successes. Additionally, having two organizational structures increases the number of teacher leaders who have a significant voice in the workings of the school. As Gordon Donaldson (2006) puts it, "Leadership is about how I can help cultivate relationships among talented and well-intentioned educators and parents so that we all can assure that every child learns" (p. 3). Changing the culture from one in which the principal is the only leader to one in which there is collective ownership of the work of schools and many voices are heard is a powerful practice and, in some schools, requires a shift in perspective. With this model, we're no longer talking about a single raft guided by a single expert but an arrangement in which the river guide must depend on multiple leaders in multiple rafts to be alert to the challenges and obstacles of the journey and to move together in some systematic fashion for the success of the outing. A shared leadership model of governance means principals seek out others in their school to build partnerships, tap others' strengths, and jointly move the vision forward. Principals who believe and act in ways that are invitational and support a common purpose understand that strong relationships with their faculty, developed through both formal and informal interactions, is fundamental to motivating everyone to move in the same direction. Think of how multiple boats on a rafting trip reach their final destination. Some rafts will run the rapids; others will portage around the rapids to reach calmer waters. Each raft takes the route that's best suited to the skills of the group onboard. What really matters is that all rafts travel to and reach the same destination; for schools, that destination is improved student learning. Remember the "Welcome Back, Teachers" letter at Lake Oswego Junior High? The new principal who wrote it was making the point that business as usual was changing. On that late August morning, the 46-member faculty met and moved directly into an all-school teambuilding activity. Each person relied on the next to complete the activity. Debriefing afterward over a picnic lunch, the faculty identified the strength of the activity as the opportunity to work together and talk with one another. The general mood was that they were all in it together, sink or swim, and they were glad to have partners to help them succeed. After lunch, the entire faculty engaged in a lengthy discussion about the focus for the upcoming year and brainstormed ways to keep positive team spirit alive. Everyone was invited to participate in the creation of the school's action plan and focus for the year. The day ended with department teams aligning their goals to the school's common emphasis. In this simple way, one school moved toward a new model of shared leadership. Ruben is a 7th grade science teacher in a very crowded K–8 school. The district's second K–8 school has seen its enrollment drop dramatically and has classrooms to spare. In response, the school board announced a change to the current configuration: The two schools will have one year to examine middle-level best practices and create a new 7th–8th grade school, with a 6th grade to be added after the first year of operation. The district has provided funding for six teachers to meet for four days over the summer, at which time they will outline a plan and draft a calendar of meetings for the upcoming year. Ruben is one of three teachers identified to lead this configuration study, and the plan is for him to stay on as the 7th grade team leader when the new school opens. Relationship building is much on Ruben's mind. He'll be in charge of uniting two groups of adults hailing from two schools used to seeing the other as a rival. How will he go about this? What kind of support will he get from the new principal? And what will the new principal expect from him? With any change in leadership, the culture changes. It's important to be proactive—to embrace collaboration and reach out with support and enthusiasm. When forging working relationships, it helps to be clear about what you believe, be flexible, and give things time. A change in leadership is an opportunity to define a new vision, look critically at what's working and what needs improving, and set a new course, factoring in the perspectives of all parties. Teaching and learning should always be at the center of what is done at school and in teams. A significant portion of team time should be devoted to professional learning conversations. Strengthening relationships within a group of adults who will be working together is important for any group's success, but it's especially critical in times of change. Planning activities that will help group members learn more about each other as people and as professionals is a great start. Ruben could model his intent to emphasize collaboration by asking a teacher from the other school to partner with him in planning over the summer and addressing relationship building early on. The plan and calendar they draft together might alternate meeting sites and divide tasks, thus honoring both faculties. It might stipulate that both faculties will be called on to react to and shape the subsequent action plan. Ruben would also be wise to acknowledge the fears, concerns, and anxieties that this large change will cause to both faculties. A discussion of the unknowns they're facing—and how the faculties might work through them together—can set a positive model for the team's subsequent functioning. Similarly, Ruben should ask to meet for a one-on-one conversation with his new principal. During this conversation, Ruben might ask her about her vision for the school, her support for teams working together, the ways she wants to work collaboratively with her teacher leaders, and what she sees as teacher leaders' function in the school. Ruben could help shape the principal's thinking on these topics by being supportive of her vision and by urging her to involve the teacher leaders as the new school takes shape. This melding of faculties will be stressful to all, so ongoing, open conversations will be critical, as will sharing information and planning and working together. Interdependence is the organizing principle that links the five critical core characteristics into a cohesive whole and ensures their ongoing functionality. Ask yourself: How developed are these five core principles in your school? What are the connections among the five? Is your school moving toward a common vision? What is your school's primary focus? Do you have supportive organizational structures to help all students succeed? What are the common beliefs at your school about how students learn? What connections are there with parents and the community? Are these connections working? Highly effective schools don't just choose one or two of the core principles as a focus; they understand the interdependence of the five. Their approach is holistic, built around a common vision. As a starting point to begin forging this interdependence of principles, engaging the faculty in this visioning activity signals a receptivity to change. Unless you know where you are going, you will meander along and perhaps miss your desired destination. We operate by listening and asking probing questions. All faculty members are engaged in decision making, as appropriate. All faculty members know the goals we're working to achieve. When operating norms like these are set in motion, the commitment to carry out the school's mission becomes a collective one, and the shared responsibility for student learning forms the foundation for shared leadership. To encourage interdependence and shared leadership, it's essential to embrace collaboration and invite multiple voices to join the conversation. Consider the following examples of what shared leadership looks like in schools, and note how they support various core characteristics of high-performing schools and invite collaboration and multiple voices. Two teachers have an idea that they bring to the principal and faculty. The teachers are passionate about the idea and convinced it will have a very positive effect on teaching and learning. The principal and faculty members listen attentively to the teachers' pitch and ask them to develop the idea more fully, consider time and resources and the overall school improvement plan, and then bring an action plan to the group for consideration. The principal asks for staff volunteers to work with the district's math curriculum coordinator to analyze recent math test scores and bring a detailed analysis of strengths and weaknesses back to the math department. The math analysis team will recommend the kinds of support or resources they believe will strengthen students' math prowess. The science department has adopted a new textbook. The principal asks the department chair to bring the rest of the faculty up to speed on the new curriculum by sharing the major learning strands and soliciting comments. By engaging the entire faculty in looking at the key science topics, the principal provides support to the department chair as she guides the faculty in identifying concepts that cross curricular boundaries. These initial conversations will assist academic teams as they connect learning across departments. Literacy is a districtwide focus for the year. A group of teachers from different disciplines meets over the summer with the objective of pinpointing the reading comprehension strategies each will teach and monitor throughout the school year. Group members will design model lessons and assessments. The group will let the principal know how much time they'll need during the August inservice to share their materials with the rest of the faculty. A cross-grade group of elementary teachers decides to study student math-placement practices with the goal of suggesting modification to current grouping guidelines. They form a learning team and plan to devote a semester to researching the topic. At the semester's end, they plan to bring their research-based conclusions and best-practices recommendations to the school's leadership team for consideration. They agree to keep the principal abreast of their activities and share relevant materials and studies through regular updates. Three teachers, all new to the profession, are joining the faculty. The principal reviews the rookies' assignments with the rest of the teaching staff and asks who might have the interest, expertise, and time to work as a first-semester mentor. The assignment will entail two half-day, administration-led training sessions for both the mentor and new teacher prior to the start of the school year and then monthly afterschool meetings with the group of other new teachers and their mentors throughout the first semester. Beyond this, mentor teachers will spend time with their charges as needed. In each of these examples, notice how principals multiply their effectiveness by creating the conditions and vehicles for shared leadership. Inviting a teacher or teachers to take on the responsibilities of leading a group leverages shared commitment to the collective goals. The necessary condition is that these teacher leaders have the knowledge, skills, and disposition for building strong interpersonal relationships necessary to support effective teamwork. They must be adept at creating a community of peers that can function as a resource for one another. Teachers and teacher leaders, then, are at the heart of this interdependent model's five core characteristics of effective schools. 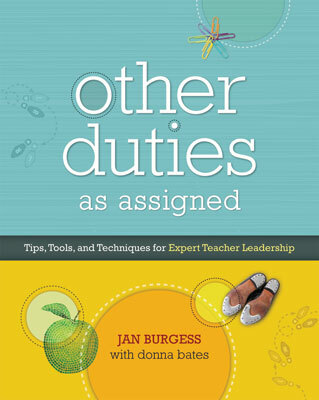 Little (2000) puts it this way: "The target of teacher leadership is the stuff of teaching and learning" (p. 396). In this model of interdependence and shared leadership, all staff members have a twin focus: (1) how we work together—relationships; and (2) what we work on—teaching and learning. The building principal's responsibility is to intentionally build capacity and broaden the role of leader so the complex work of schools can be done in an organized and systematic fashion. Regardless of the organizational structure in which teachers find themselves, the keys to success are developing "a collective sense of what is important, and why" (Senge et al., 1994, p. 299). Strong relationships are built and sustained when a team of teachers work together to ensure that instruction is tailored to improve student learning. Through collaboration, they find a common voice and can go on to set a plan with clear, common priorities. Left to their own devices, though, such groups may flounder. This is why the role of teacher leaders is so important. Figure 1.1 lays out the three most common organizational structures found in schools today. Each structure is based on adults working together for a common purpose. Whether ongoing professional training for teachers is a critical component of the structure depends on the nature of the group and the role it plays. The PLC framework is an important tool to focus the work of a group of peers on teaching and student learning. Some schools operate with both a traditional organizational structure and PLC groups sharing the leadership voice. Others combine their functions. As you peruse this figure, note areas of similarity and overlap among the three. Based on Dewey's model for departmentalized high schools, this is the industrial model that is still the organizational model in many schools. Meet in collegial teams to facilitate curriculum coordination. Organize time and students for maximum efficiency of school hours and requirements. Work with the principal as communication conduit. Supported by research, such as that conducted by the National Middle School Association (2003, 2005). Many variations of teams exist. Create small communities for learning so every student is well known by at least one adult. Use common planning time to improve the quality and quantity of interactions between students and teachers. Use a common vision to guide decision making as part of an expanded leadership structure. Teach a core academic program with engaging, relevant, and integrative curriculum. Empower teachers to make decisions. Developed by Rick DuFour. Various PLC models with specific protocols and strategies are available. Build a culture of collaboration. Can a high school science department also be a PLC? Can a blended 5th and 6th grade group of teachers be a PLC? Can teachers belong to a traditional department or interdisciplinary team and also be members of a cross-discipline PLC team? The answer is a resounding yes! Teams of teachers who gather with a common purpose to look at improving teaching and learning in their classrooms over time become a community of learners. As author and researcher Rick DuFour (2004) points out, "To create a professional learning community, focus on learning rather than teaching, work collaboratively, and hold yourself accountable for results" (p. 11). Think of the car you drive, whether it's a Ford minivan or a Honda Civic. The standard car model has four wheels propelled by a motor. The four wheels could be the departments or grade levels or interdisciplinary teams. The motor that drives them all is the principal. When all are in synch and working as expected, the wheels move in the same direction—say, toward the school's vision. In the newer, hybrid car model, those wheels are part of two interconnected, interdependent systems—one combustion, one electric—working in tandem. The combination of the systems makes the overall machine more efficient. Now, think of teacher leaders and their smaller teams of teachers as the hybrid's electric power system and the school's overall, principal-led organization as the hybrid's gasoline system. They are different, but both are propulsive and capable of moving "the whole" forward. Together both have specific roles and functions that are linked for efficiency and meet the energy demands for the 21st century. A newer, more responsive model is the result. In your school, what are the expectations for professional collaboration and relationship building? What structures are in place to focus on student learning and professional development? A good example of this newer model can be found at Sandy High School in the Oregon Trail School District at the base of Mount Hood. This comprehensive high school of about 1,500 students has a six-period day and is organized in departments. Departments manage and coordinate the curriculum and focus on student learning and support needs. A few years ago, several new faculty members at Sandy High agreed that something was missing. This small group went on to create a Critical Friends Group, using a set of guided conversation protocols to look more analytically at their own teaching practices and learning needs. Participation in the group eventually expanded to include a teacher leader. Eventually, one small cohort within Sandy High's Critical Friends Group, troubled by the school's high dropout rate, decided to investigate the possibility of forming 9th grade "houses," or academies. The idea was to divide students at this grade level into smaller learning teams and link two or three subjects in a block schedule arrangement. The rationale? Developing a stronger sense of community among and between students and teachers would help to boost student achievement, which, in turn, would reduce dropout rates. As the cohort at Sandy High conducted its investigations, they sought out others for critical conversations with regard to math placement, as math scheduling and the personnel available to teach math would be affected if smaller teams were created. This small, voluntary professional learning community at Sandy High School grew to 8 teachers, then to 20, and is now 41 members strong. The faculty also meets in smaller groups, across departments, to look at teaching and learning from different vantage points. Two engines—the school's Critical Friends PLC and the school's traditional curricular departments—are driving Sandy High School in the same direction: toward meeting students' learning and relational needs. Elise is a veteran teacher leader who is now working with her fifth principal in 12 years. This principal, hired from within, is new to the position. He was formerly the school's athletic and activities vice principal. Elise wonders what his leadership style will be and whether she will be called on to perform quasi-administrative tasks as he finds his rhythm. She knows new principals often bring their own agendas. What else will she have to add to her already overloaded plate? She's concerned. Shared leadership takes many forms, and teacher leaders can influence the direction it takes. Teacher leaders should be ready to extend their working relationship to the principal and be part of schoolwide teams as well as smaller, more focused ones. Consistent "it's all about learning" messages are one way to highlight a team's core values. Having this motto visible in halls and classrooms demonstrates your commitment and alerts the administration (and students and parents, as well) to what drives your work. Professional learning should be defined as the center of what is done at school and in teams. What's your vision for the school? How can we work together to support teachers and their work with students? What do you see as my role as a teacher leader, and is that open for discussion? Any change in personnel and leadership affects the whole organization. At those times, teacher leaders have a critical opportunity to influence the vision and work of the school by building support for what they believe is key to its success. So, Elise should share her dreams for the school and ask what the new principal's are. She should look for common ground and begin building there. She might consider helping her principal get started by volunteering to take on a few additional tasks, like organizing textbook checkout, setting up faculty inservice group tasks, or coordinating materials for the staff handbook revisions. This also might mean asking members of her department to give the new leader a chance and be patient with him as he gets a clearer picture of what works and what needs to change. As teams become the structure for teacher expression, decision making, and the consideration of best practices, the teacher leader focuses on keeping team conversations on track and ensuring active communication throughout the school community. Additionally, the teacher leader is responsible for seeing that teams' findings are circulated among all the organizational structures and that these findings make their way from team recommendation to classroom application. Bringing a group of educators together around a common vision, where shared leadership is the norm, small learning teams are the structure, and relationships among the faculty are collaborative, provides support for the school's core function: student achievement. In this model, where teacher leadership plays an integral part, giving teachers a legitimate voice and role assumes a readiness on the part of the administration and the teachers to raft down the same river. When teachers and administrators navigate the rapids successfully, there is a sense of satisfaction, pride, and possibly exuberance in having embarked on this journey together. Leadership profile instruments can be useful and illuminating. Many are available online. Check out the Dimensions of Leadership Profile and Understanding Personal Learning Approaches (available through Inscape Publishing/Carlson Learning at www.hughesconsultinggrp.com) and McREL's Balanced Leadership Profile, which is designed with principals and aspiring principals in mind (available at www.mcrel.org). The National School Reform Faculty Harmony Education Center (www.nsrfharmony.org) provides information and protocols to facilitate Critical Friends Groups. These can be useful to all kinds of teams. The Fifth Discipline Fieldbook (Senge et al., 1994) is a classic look at systems thinking. This book has a plethora of resources, exercises, and context for creating a shared vision and developing the components necessary for a healthy organization built on teams. Cultivating Leadership in Schools: Connecting, People, Purpose, and Practice (Donaldson, 2006) has useful information and tools, particularly in the section "Teacher Leaders as Partners in the Leadership Relationship" (pp. 80–86), in Figure 9.1: "Skills for the Leadership of Renewal" (p. 155), and in "Chapter 18: Critical Role of Leadership." What Works in Schools: Translating Research into Action (Marzano, 2003) is an absolute must-buy for its focus on research-based best practices to support student achievement. Especially pertinent are Chapter 18's look at the "Critical Role of Leadership" and the appendix titled "Snapshot Survey of School Effectiveness Facts," particularly the category "Collegiality and Professionalism" (p. 181). "What Is a 'Professional Learning Community'?" (DuFour, 2004), an article in the May 2004 issue of Educational Leadership (Volume 61, Issue 8), defines four big ideas that are the core principles of PLCs and provides compelling examples of each principle.